As your cat gets older, it will need your help staying active and engaged with the world around it. Cats already tend to sleep 12-16 hours a day in their prime, but as they get older they only get more sedentary. If a senior cat is allowed unlimited access to food and its owner does not look for ways to get them active, then the cat is at risk for serious health complications. These include obesity, diabetes, asthma, osteoarthritis, cardiovascular disease and more. To prevent these diseases while improving your cat’s mental and physical health, you will need to determine activities that can help your cat get motivated to move. Dusting off your old VHS copy of Richard Simmons’ “Sweatin’ to the Oldies” won’t work, either. Your activities must fit your kitty’s personal interests and abilities. The first step is to ensure your senior cat care plan takes into account your cat’s unique health situation, including their pressing needs as well as their current limitations. During your cat’s next exam, ask the vet to note any conditions that may be helped or hindered by extra movement. For instance, your cat may need to walk around more, but inflammation in the hips may mean that their days of leaping three feet in the air are over. Get recommendations from your vet, and pay close attention to activities they say you should somehow curb or avoid altogether. Also, since treats are a great motivator for extra movement, see if your vet can recommend a healthier treat or a limit on daily snacking to guide your cat’s get-fit routine. Your senior kitty will not feel motivated to move about the house if your floor, couch, and chairs are literally the only places for them to explore. Instead, ensure that they have high-up perches for observing both you and the outdoors, and make sure these perches can be reached without excess jumping or acrobatics. For instance, move a side table and chair next to a window ledge where your cat can observe nature outside. Give them a cat tree for overseeing the living room, but add extra steps so that they can easily reach the top. Just a little bit of movement throughout the day is preferable to bursts of energy followed by day-long naps. As your cat gets older, food may be their biggest motivator. Take advantage of this! Rather than simply plopping a treat in front of their amiable fuzzy faces, have them chase the treat across the floor or reach a certain point on their cat tree. You can also make DIY cat puzzles out of items normally destined for the recycling bin, turning munch-time into playtime. As for their regular food, see if you can adjust its location and have the cat go just a little further to reach it. The last thing you want is for kitty to go on a hunger strike because they can’t find their bowl, but if they have to go a few more feet for some kibble, the extra movement adds up. Pet owners are often guilty of buying pet toys they like, but keeping senior cats engaged means discovering toys that drive their inner predator. Some cats prefer to chase things like ribbons, belts and fabric. Others love nothing more than tearing into some feathers, making wands a perfect toy. Still, others enjoy chasing after toy mice, or even battery-powered critters that skitter across the floor. Be patient when playing, and try to think of ways to make your toy more like prey. For instance, with a cloth belt, you can slowly pull it out of view around a corner. Even the most grizzled kitty cannot resist pouncing at the last moment before the belt wiggles out of their sight. Moving to a new home in their senior years places a huge amount of stress on cats. You can make the move easier on them by using a specialised cat moving service. 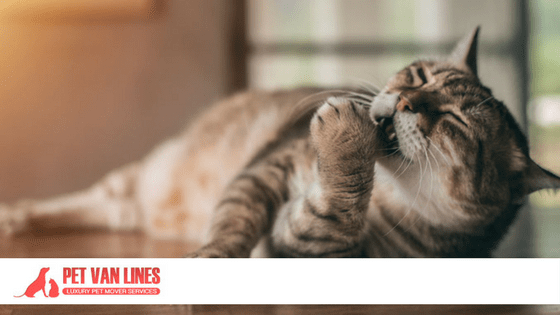 Pet Van Lines’ vehicles and friendly staff transport your kitty in comfort while attending to their every need. Playtime is part of the gig, too, ensuring your grizzled kitty’s cross country trek is enjoyable every mile of the way. See some of our happy customers and take the time to discover ways to make life easier and more active for your fuzzy friend as they move into their golden years.